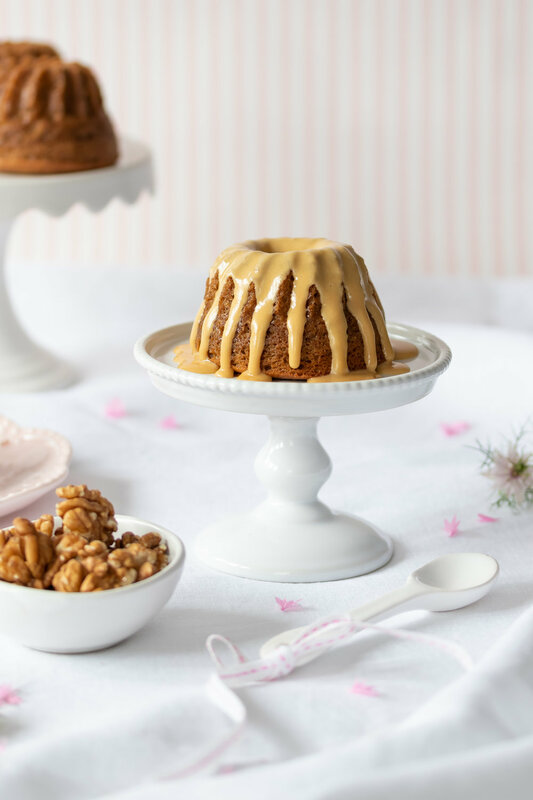 My New Year’s resolution is to reduce my caffeine intake, so I think it only fitting that my first post for 2019 be coffee and walnut mini cakes… In all seriousness, this recipe is super easy to make and ridiculously delicious! You can use decaffeinated coffee for this recipe if you like - I use French press coffee for the cake (30ml ground coffee to which I add 100ml hot water, allowing it to brew and cool slightly). If you do not have mini bundt shaped tins, use a 12-hole standard muffin tin instead. 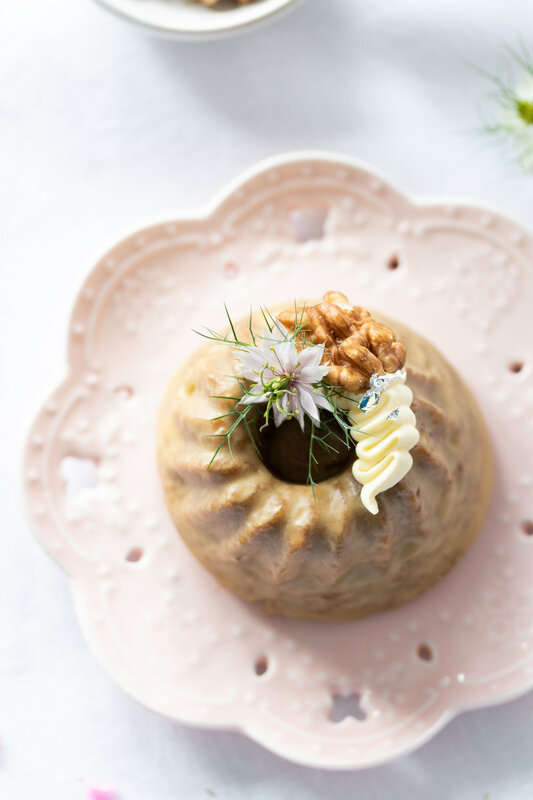 You can also bake the entire batter in a loaf tin or round cake tin. To start, preheat the oven to 180°C (160°C fan) and grease spray a 12-hole mini bundt tin (or silicone mini cake pan or 12-hole muffin tin). After separating the eggs, place the egg yolks and sugar in a large mixing bowl and using an electric mixer, beat together until pale in colour. Dissolve the instant coffee in the lukewarm espresso or French press coffee then add to the yolk and sugar mixture. Add the milk and oil and combine using a hand whisk. Add the flour and salt to this mixture and whisk by hand until the mixture is uniform. In a clean, dry mixing bowl, whisk the egg whites on a high speed until stiff peaks. Fold the beaten egg whites into the batter mixture using a large metal spoon or spatula (at first just a little to loosen the mixture, then gently fold in the rest). Fold in the chopped walnut pieces. Divide the cake batter between the pan holes and bake until golden and a skewer inserted in the middle of a cake comes out clean. Remove the mini cakes from the oven and cool on a wire rack. To make the glaze, mix the icing sugar and espresso until smooth (if you want a thicker icing to drizzle on top, adjust by adding only a little espresso). Place the cooled mini cakes on a wire rack with a baking tray at the bottom. Pour or drizzle (depending on your consistency) the coffee glaze over the top of each mini cake (you can glaze the mini cakes twice if you have glaze left over and you prefer a sweeter finish). Allow to set for a few minutes. Serve with mascarpone and an extra walnut halve on top. Enjoy!